Hello again everybody. For those who have not heard or have heard and came here looking information I am running for Community Liaison of the University of Winnipeg Students Association. You can find the Facebook event page with more information linked: https://www.facebook.com/events/244169752340717/. As many of you may know I have been involved politically at both the municipal and provincial levels over the past couple of years and I would love to bring that proactive political spirit and experience to the UWSA. Vote for me and I will promise to bring political issues to the forefront with an open door to the issues that matter for University of Winnipeg students. I hope I can count on your vote from March 12-15. The southeastern corner has experienced rapid growth with the recent release of the 2011 Census data. Nearly every town and city in the Hanover region has experienced vast growth, including Steinbach as the third fast growing census agglomeration in Canada; and La Broquerie. What does this all have to do with high speed rail? Peter Lacey the western vice-president for Transport Action Canada recently issued an article in the Winnipeg Free Press together with Jeff Lowe. In this op-ed they announced how Minnesota is in the opening procedures of pursuing a high speed rail link of 175 km/h between Minneapolis and Duluth. These two suggest that Manitoba themselves should not be left out of the conversation. They look at whether or not the CN rail link between Winnipeg and Duluth itself should be upgraded to a passenger high speed rail link. In doing so it would allow Manitoba another valuable international link. They particularly highlight that by having passenger service on a Winnipeg, Duluth, Minneapolis link would vastly boost tourism not only to Winnipeg, but the francophone communities of La Broquerie and Ste. Anne, as well as the Mennonite community here in Steinbach. Though realistically the tourism boost would only be moderate at first, if the communities here adapted the economies, there could be further significant boosts. Beyond this, the high speed rail service could function as part of the Winnipeg commuter shed. With service running from La. Broquerie to Winnipeg as part of a shorter stub commuter train, it could also vastly boost growth for those communities directly, as well as Steinbach, if proper shuttle service from stations in those towns linked with the city here. Well this is admittedly a little pie in the sky at this moment, the fact remains that if indeed Minnesota pursues its option and Manitoba jumps on board, it opens up countless of opportunities that could further boost economic and population growth for this corner of the province. In addition it provides this prairie province and the entire southeast with a major international link that often isolates us in our way of thinking and dealing with our neighbours. There is still plenty to pursue, such as whether CN would actually allow passenger service on its lines. However, it would require minimal investment above its current state that would allow the 175km/h passenger trains to run through according to Lacey. Given the massive economic boost for the province as a whole, it would be great for government officials to at least pursue investigation of the viability of the route, and open up to negotiations with Minnesota as they pursue their portion of the line. As Lacey ends with his article, with so many benefits and further possibilities, it would be extremely shortsighted on our part to not embark on at least a basic official study of viability. With all the talk of various economic crisis and the protests in the forms of the Occupy and Tea Party movements throughout North America, I felt the need to add some clarity to the debate. Hopefully, without some of the cynicism and hyperbole. First things first we must talk about the how and the why of the crisis within the United States of America. This requires some backtracking to the last great banking inspired crisis in the late 1920s and as to what the outcomes there were. Part of the reason that economic recession then was so severe was the fact so many banks went under. Over 11,000 banks went under between 1929-1933 and with those banks went many people’s savings. As people became aware their savings were at risk many quickly went to withdraw their funds, thereby accelerating the process in something called a “bank run”. Thus as banks only have so much money on reserve, the banks crashed, unable to fill the demands of peoples hard earned savings. Probably the most difficult thing about this crisis was that it foreshadowed our very own crisis as the banking industry manufactured the crisis all on its own. The lesson from the Great Depression was that the banks had too much liberty to make decisions, many of them risky, that not only put peoples savings at risk but the entire U.S.’s economy and much of the globes as well. The decision was then made to keep government oversight in the banking industry through the Glass-Steagall Act. But as with all things dealing with powerful corporations in the U.S., they gradually got their way through government lobby. The companies complained about regulation throughout the decades, that it was profit limiting and generally stiffled themselves and the economy. With the rise of neo-liberalism (or the process of de-regulating and less government) in the late 1970s, and through powerful icons like Reagan and Thatcher, de-regulation quickly became common practice throughout the Western World. Driving the economy with quick and rapid growth. This process of neo-liberalism accelerated through the U.S. and the Western World throughout the 1980s and 90s. Finally it came to be that in 1999, the Glass-Steagall act was overthrown by the bank lobby. Thus, after sixty some odd years, the regulation of the banks was pulled back. In the U.S. both parties of Democrats and Republicans share some guilt in allowing this to happen, and it certainly was not a partisan debate. The banks gained the ability to make unsafe and risky decisions with the de-regulation of the security and mortgage departments in 2004, just 5 years after the Glass-Steagall repeal, a crisis was set in motion. In 2007 U.S. Secretary of the Treasury, Henry Paulson declared that “An open, competitive, and liberalized financial market can effectively allocate scarce resources in a manner that promotes stability and prosperity far better than governmental intervention.” Then, as we know, in 2008, the crisis hit. As the risky mortgage plans put banks into turmoil, they crashed as the mortgage defaults exposed the risky of the U.S. fractional reserve banking. As in the Great Depression, government intervention became important for the survival of the banks and peoples savings. In order to prevent a similarly massive recession as in 1929, hundreds of billions had to be injected to support banks as the defaults put billions of dollars of peoples savings at risk. Here is where we have to look at the various protest groups and the effect on Canada. Our country, as with some other nations like Mexico, have more regulated banking systems that force banks to keep more cash on reserve than the meager sums of U.S. banks. In addition, Canadian banks are more centralized and did not take part in the folly of the high risk mortgages that imperiled the U.S. banks. The Tea Party movement, the protest of the libertarians, and a descendent of the earlier Reaganist movements were quite clearly upset with the hundreds of billions being used to back up the banks and the other various industries within the U.S. economy. As they should be, as are most political groups. The problem is the deregulation they preached so fanatically was the issue at fault, for causing the crisis in North America itself. It was the corporations that “seemingly” do things better when liberalized, as espoused by Paulson, that plummeted the world into crisis. Canadians too have a right to be outraged, as our economy, so closely tied to the U.S.’s was also plunged into a recession with billions being pumped into the economy to keep things afloat in a crisis we did not cause. Though we were fortunate to dodge the full front of the mortgage crisis, many consider us lucky that the crisis happened when it did as Canada was on a path to deregulation itself. Though the banking system in Canada was fortified against such issues by Paul Martin, Marxist academics were critical, saying that the path was on its way to deregulation here and had Canada not been in a minority government that Canada too could of found its way into trouble. It is certain, if I may be allowed to take at least one shot here, that if the Conservative government with the ideology it is locked into would likely have had its way with deregulating the banking system here in the Great White North. The 1990s themselves showed that leaders such as Harper and Manning pressed hard for de-regulation, a situation we should be thankful that Mr. Chretien did not cave to in entirety. As it is however, Harper is basking in the merits of the previous governments banking system. Mark Carney himself, Canada’s Governor of the Bank of Canada is now head of the Financial Stability Board. This is the new global regulatory agency that is exporting Canada’s wonderful financial system (by chance or otherwise) to the rest of the world. Predictably, the banks in the U.S. are already grumbling about having to increase the amount they have on reserves, an issue Carney has pushed forward already. Yet, if there is something we have learned over the two financial crisis’, it is this, that banks cannot be allowed to manufacture crisis that put billions of users life savings at risk and will require billions in taxpayer bailouts to keep it that way. The banks have wasted enough. Certainly banks should be able to participate in a liberalized economy, to a degree, but they should not be able to operate with so much leash that another global meltdown is unleashed. That describes the North American crisis in a nutshell which brings us to the Occupy movements. First of all I would like to say to the author that accused another writer of being a “communist”. First of all if you would like to present an honest statement in a paper please do not use the term communist. Communism preaching closed market systems has long since died, were you to use this term in such a way to describe socialism, you would fail any paper if I were to mark it and it crossed my desk. Not only that, but it discredits the rest of your article. I do not agree with unrestrained socialism, but to use the term communist, or socialism as a pejorative is silly, this is just an alternative viewpoint one of three main ones. As for Occupy movements I have friends and classmates currently in the encampment. I certainly do not agree with all of their viewpoints and realistically they will likely accomplish little. However I feel it is fair to clarify their viewpoints in that. Someone spoke to me in Steinbach this weekend, enraged over the occupiers saying that they should “never be allowed to get jobs” and that “if they think things are so bad, they should go to another country”, just to paraphrase. I think if you were to talk to these people that that is exactly what they are protesting against, global inequality, and corporate greed. These are certainly issues that are tied into this most recent of crisis. These two sentences themselves break off into further longwinded arguments such as dependency theory (why some nations cannot develop despite trading with developed nations such as ours, as predicted by liberalism), and I believe I have really gone on long enough. As Stéphane Dion said recently, that the protests would have been more productive had they been larger and shorter. Now, with the revelation of unsafe situations, the occupy camps have likely run their effective course. Needless to say, while I remain pessimistic about their outcome, I respect the rights of these young educated citizens, many of them still working at their jobs, while others have taken time off to attend as necessary, in order to protest. In most cases I would wager that these people are doing more through activism than the majority of us who just grumble about the issues and crisis at hand. Though I do not agree with them in entirety, I respect their right to peaceful assembly as guaranteed in the Charter of Rights and Freedoms, to protest against the corporate greed that tumbled the world into the unfortunate situation that we were in. Though there is more to talk about such as the Greek Crisis, Keynesian economics (the process of a more regulated liberal economy), and much more perhaps I have taken up enough space for one week. Today is E-Day (election day) and what a beautiful day we have compared to the municipal election last October. Voter turnout at advance polls is double what it was in 2007 and Steinbach has been one of the busiest polling ridings, at least as far as last week. Live results should also be available at that site tonight as well. Aside from that I hope its a wonderful day with good news for Liberals here in Manitoba. We have four seats to really keeping on including Dr. Jon Gerrards in River Heights, Roldan Sevillano Jr. in Tyndall Park, Paul Hesse in Fort Rouge, and Twyla Motkaluk in Burrows. The other close seats would be in The Maples where Pablito Sarinas is close as well as in St. Norbert where Marcel Laurendeau has a great shot as well. Regardless today will prove to be an exciting night and I thank everyone including my family for their support during these last few weeks. I think elections are hardest on family most of all as it is difficult to hear certain things said, or when support does not always come as it should. As well thanks to all the friends new and old who have helped on the campaign, I could not have done it without you! So with that, happy voting day! We are less than a week away from election day on Tuesday, October the 4th. I thought I would take the opportunity to talk about some of the highs and the lows of the campaign thus far. Today on Wednesday I again had the opportunity to speak to an elementary class about politics, this time I spoke with the grade 4 classes at Elmdale Elementary School in Steinbach. (Earlier had spoken to all three grade six classes at Woodlawn Elementary School in Steinbach). The grade fours were certainly more excited to see a real life politician (though I do not know if I consider myself a real politician just yet, though I suppose you could say that). I enjoyed talking to them about some of the day to day goings of a politician but they were also very interested in some lighter topics such as “what is your favourite burger?”. This made it all very entertaining, though I think as we got off topic toward the end it may have hurt the education factor for the teachers. That being said both these school visits were extremely rewarding and I hope these young kids can be the next generation to go and talk to some of the future political leaders of our community. One of the downs of the campaign certainly has to be the lack of participation from the NDP here in Steinbach. They seem to be concerned with close ridings like Dawson Trail more than anything, utterly oblivious to anything that is going on here in Steinbach. While I am sure that Dally Gutierrez is a great person she has stymied any attempts at democracy here, including squelching of the debates. This not only hurts candidates such as myself who depend on these mediums to get our message out, but it hurts the voters here in Steinbach as well as they have less of a channel to question candidates on some of the top issues of the day. Overall it has been quite a fun campaign, if not a little busy and stressful. I encourage voters to get out and go to the advancing vote polls at the Steinbach 55+ building and in south Clearspring Mall as they are open from 8am-8pm. I am told the advance polls here in Steinbach are the busiest in the province and it would be great to keep it that way. Once again lets get out there are vote, I realise that it may seem a mountain to climb in terms of votes, but everything counts, and it is all about building not only for 2011 but also to build into a legitimate campaign in 2015. So on that note I hope I can count on you to vote, so get to those polling booths! So much to do and not enough time to do it in. 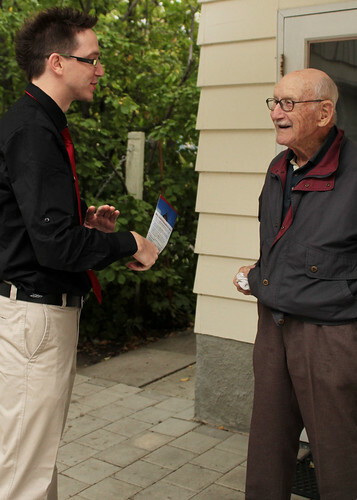 But here are some pictures from the campaign trail, I hope to catch up with you the voter and reader soon! Campaign is building up steam! There is more room on the Vote Fehler wagon as well! Plenty of good words in local media and positive response to some of the planks of the platform. Grant Burr of The Carillon has gone so far as to address my campaign saying of myself that “Lee Fehler has been the strongest alternative to Kelvin Goertzen” here in Steinbach. We have lots to offer local residents in terms of slashing the payroll tax to promote business, something that neither the NDP or PCs have done in their time in office. Increasing day care spaces, restore the quality of our post-secondary education institutes. The University of Manitoba has consistently been ranked in the bottom of its pool in terms of doctoral schools. This is so important that we invest to keep our grad students here in Manitoba so as not to have a “brain drain” of our brightest and most dedicated to other provinces. 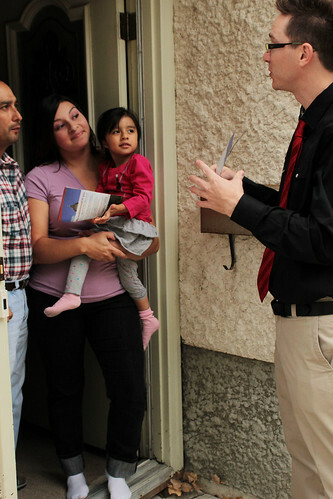 On October 4th Vote Fehler, vote for the Liberals and lets create a safer more prosperous Manitoba together! Lee Fehler is officially announcing his successful nomination as the Manitoba Liberal Party’s MLA candidate for Steinbach. 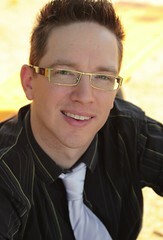 Though a relatively new face to the political scene in southeastern Manitoba, residents in Steinbach will be familiar with his name where he recently ran as a candidate for Steinbach City Council. 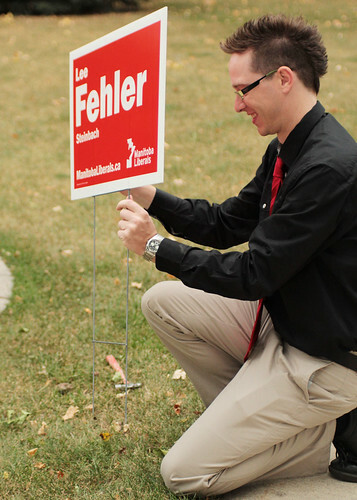 Fehler is strongly interest in serving both the city of Steinbach and surrounding area, this passion for his community has once again drawn him into an election. Over the last few months nothing has gotten the people of Manitoba more incensed then the route of Bipole III. Politically the issue has become increasingly partisan and some of the facts are becoming blurred. A quick history lesson on the issue starts in 2002 when Manitoba Hydro began speaking with First Nations and northern communities to discuss the possibility of an eastern route. Documents released then showed that there was little to no benefit was shown for First Nations with regards to financial and environmental sustainability nor was there any benefit for an all-weather east side road. In 2003 all planning for an east side Bipole route was halted while the East Side Planning Initiative finished its investigations which concluded in 2005 and ultimately decided that an alternative route would have to be planned. The decision was made primarily by First Nations communities who are driven for the creation of a UNESCO environmental heritage site the size of Denmark. The park would span two provinces, had the support of the federal government, several First Nations, and a majority of environmental groups. What’s interesting to note is that the UNESCO site in Labrador was also subject to having power lines running through it on the east coast, what is important to note is that recently it too was spared and the line re-routed, this time with a submarine cable to Nova Scotia. This last part is something we’ll touch on later. It was at this point that things became extremely partisan, Hugh McFadyen who for several years was criticised as a leader for the PCs who failed to build support for the party. Many negative comments were made over some of his promises such as when he said he would bring back the Winnipeg Jets. However with the Bipole III he truly had his first visible and justifiable political impact. The length of the alternate western route was nearly 500km longer and present costs put the Western Route at 2.2 billion. McFadyen estimates the east side route as being around 1.72 billion or about 450 million dollars less. It is unclear however where exactly McFadyen and the PCs have gotten their numbers as no official releases were made. However McFadyen has stuck to his guns and constantly attacked the western route which now is routed through several PC heavy ridings. When discussing finances it is important to note here is that historically Manitoba Hydro has spent over $400 million dollars in its negotiations with First Nations groups. Considering the 5 main First Nations groups involved with Pimachiowin Aki UNESCO site it becomes obvious that these superficial costs for an eastern route could easily exceed the western route. The Canadian Taxpayers Federation has also jumped in with its support for the eastern route. However on the taxpayer aspect it is important to note that none of Manitoba Hydro’s past or current projects are found within the budget. Neither the 5.1 billion dollar Conawapa dam or the 1.5 billion dollar Wuskawatim dam can be found here either. In fact Manitoba Hydro is a crown corporation and these projects, including Bipole III, will be paid by ratepayers. These are the same Manitoba ratepayers who in fact pay some of the lowest rates for electricity in Canada and the world. So obviously this issue is not truly about money at heart, it is certainly an issue but not however the deciding factor. What is apparent however is now instead this western route hast put it solely in Manitobans and particularly rural farmers backyards. Coincidentally, these are traditionally Progressive Conservative areas and politically this costs the NDP nothing to raise the ire of this voting base. Naturally those now on or near the route are incensed, just as those on the east side were earlier. So rather then this becoming a financial issue, this is increasingly becoming a NIMBY (Not In My BackYard) issue. I discussed earlier how just last week Newfoundland and Labrador put their hydro wires under the Atlantic rather then through a UNESCO site. Enter Dr. John Ryan, a retired geography professor from the University of Winnipeg. In 2008 he proposed a very detailed and lengthy report discussing the issue of putting a submarine cable under Lake Winnipeg. The report is readily available if searched for on the internet and details how the overland route would only go through 363 kilometres of boreal forest and the submerged cable would follow a length of 350km. Costs of the route were very specific and placed the cost around 2.0 billion, about $200 million less then western route, Dr. Ryan also states the savings could be up to $450 million when line losses are included. More importantly this Lake Winnipeg route would significantly reduce the impact on Manitobans life, was safer from the elements, reduced the damage done to boreal forests, and most importantly of all kept the hydro lines out of peoples backyards. 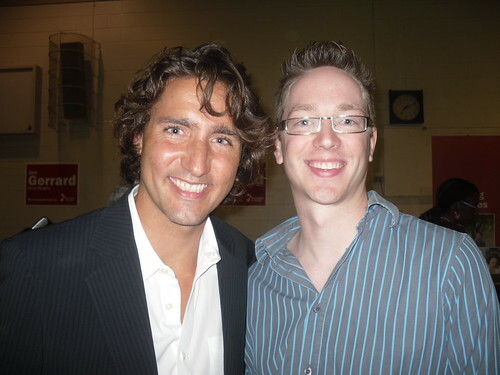 Premier Selinger to his credit did allow for the possibility of this route and entered into discussions with Ryan. However some time later it was clear they had no intention of investigating this route and rather they and Manitoba Hydro were focused on fast tracking the western route. Liberal leader Jon Gerrard has championed this route but it will take much more then he to get this project done. If McFadyen truly has the best interests of Manitobans at heart he would be wise to investigate this project more thoroughly. Recently when Gerrard questioned Manitoba Hydro CEO Bob Brennan whether he had contacted Transmission Developers in Toronto who specialize in underwater cables to which he replied no. The odds of a submersible route for Bipole III seem less likely now more then ever. It has become clear that in all likelihood partisan politics and the strength of NDP support in seat heavy Winnipeg will put Bipole III down the western route. There is still time for a Lake Winnipeg cable however, if responsible leadership can be found will support it. If the western route is finalised however, it must be noted that Manitoba Hydro plan a Bipole IV and Bipole V shortly. Lets hope for all of our sakes that Manitoba Hydro have fully investigated submersible cables and routes by then.